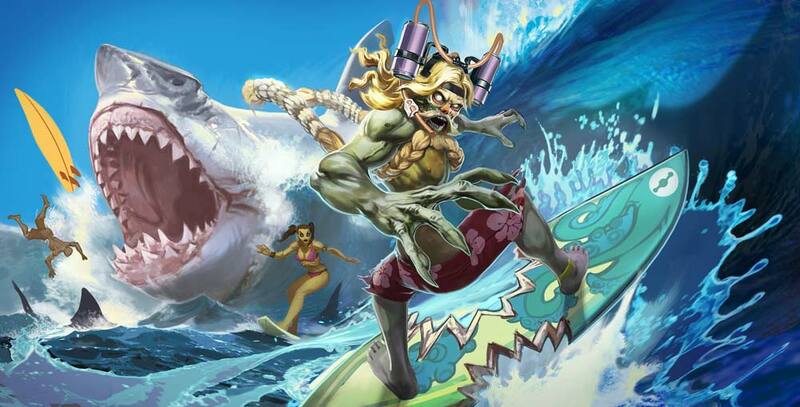 The first skin to join the fun is Summer Party Krul, arriving in-game June 24. You can unlock this seasonal skin with ICE or through collecting special Summer Krul cards from post-match spoils, chests, a special ICE box and Summer events. In the hour after the patrol of dawn, when the sun rose and the groms and the kooks crowded the whitewater, as the wind chopped and sprayed the waves, I paddled the surfboard of doom toward shore in a rush for crunchy sustenance. In the deep sandy trench I saw it: a gliding fin rising off the surface, a carnivorous monster hunting its prey: a snorkeling damsel just under the surface. My last heartbeats pounded in terror as I, without a thought for my life, dropped into the next wave and snaked in between the beast and distressed lady. I carved the face and caught air, landing the board square between the bladed jaws of my horror. Thanks to my shredding expertise, that lady lives to this day. I was not graced thus by fate. In my tangle with the great shark, my bitten board was thrust into my heart and my life damned ever after. Not for thanks did I this heroic deed, but for my lost honor. And a Spectral Smite surprise that you’ll have to see to believe! 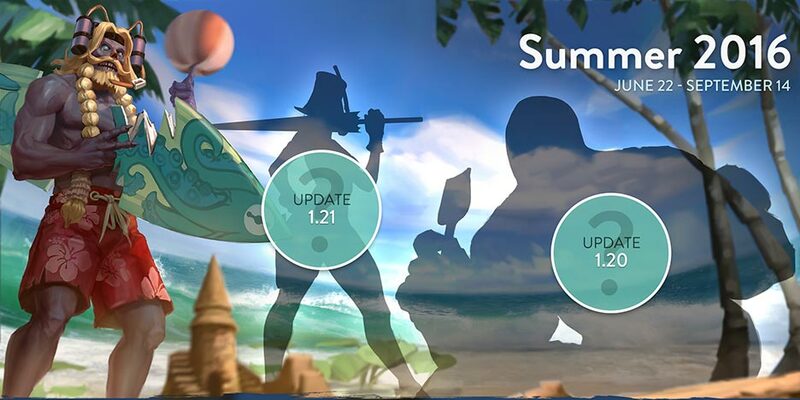 Updates 1.20 and 1.21 will also feature exclusive Summer skins of increasing rarity and difficulty to achieve. 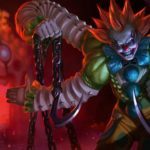 Summer Party Krul will remain available for purchase and card crafting throughout the entire Summer season (through Update 1.21). The future mystery skins will also remain available until the end of Summer. Summer Card Parties Every Weekend! You can achieve 1 Summer Krul card during each event (max 2 per weekend). *All events run from 5PM PDT / Midnight GMT to 5PM PDT / Midnight GMT. Saturday and Sunday are separate card events. Get max 2 cards per weekend.